You use the Workflow tab to display the Workflow page. You use the Workflow page to define the behavior of the workflow for the provisioning request definition. The Workflow page consists of a canvas, a palette, and associated views. 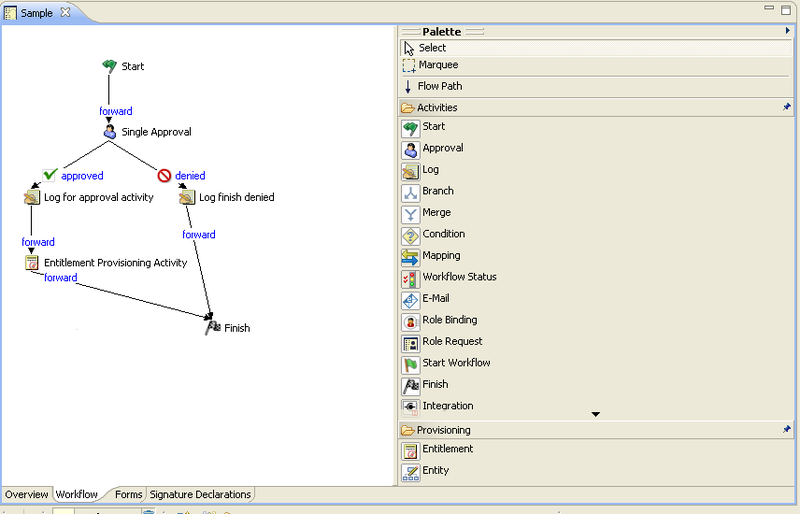 The canvas provides a graphical view of the activities in the workflow. When you create a new provisioning request definition that is not based on a template, the canvas is blank except for a Start activity and Finish activity. Deletes the selected activity or flow path. Switches the workflow editor between displaying activity names and activity IDs. Activity IDs are system-defined and are not editable. However, if errors associated with activities are detected during validation, Designer identifies the activity in which the error occurred by activity ID. When this is the case, turn on the display of activity IDs in order to locate the activity on the canvas. You can specify whether activity names or activity IDs are displayed by default by choosing Window > Preferences > Provisioning > Workflows > Diagram Preferences > Show Activity IDs. Turns the display of flow path types (for example, forward, approved, denied) on and off. When Show Flow Path Types is turned on, a label is displayed on each flow path indicating the flow path type. Displays the Properties view for the selected activity. 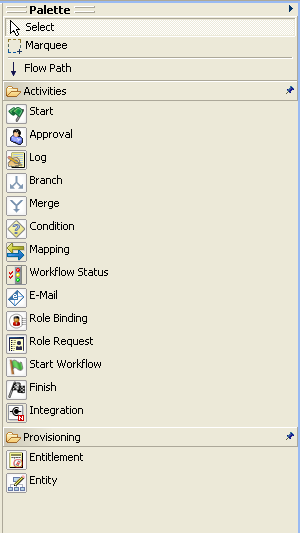 If no activity is selected, displays the Properties view for the Workflow itself. Displays the Data Item Mapping view for the selected activity. Displays the E-Mail Notification view for the selected activity. Zoom: Increases or decreases the magnification of the workflow display. You can make portions of the workflow display larger and view more detail, or make the workflow display smaller and view more of the workflow. Click the rectangle to the right of the Zoom slider to return to 100% magnification. Scale: Increases or decreases the spacing between items in the workflow display. For example, if your workflow has items with many flowpaths between them, you can increase the scale to make it easier to see individual flow paths. Click the rectangle to the right of the Scale slider to return to 100% scale. Selects individual nodes or flow paths. To select a node, click the Select tool, then click a node. Selects multiple nodes or flow paths. Use this tool to move items as a group. To select multiple items, click the Marquee tool, then click in an area outside of the items that you want to select. Hold down the mouse button and drag over the items that you want to select, then release the mouse button. When multiple items are selected, only the properties for the first item selected are displayed in the Properties view (see Section 6.1.3, Views for information about Views). Creates flow paths between nodes. Flow paths provide connection logic for connecting nodes. For information about connecting nodes, see Section 6.3, Adding Flow Paths. Inserts the selected activity into the workflow. For information about adding activities, see Section 6.2, Adding Activities to a Workflow. For detailed descriptions of the activities, see Section 7.0, Workflow Activity Reference.